Bram Stoker Festival once again welcome the internationally renowned spectacle company Macnas to the streets of Dublin for an unforgettable nighttime parade. 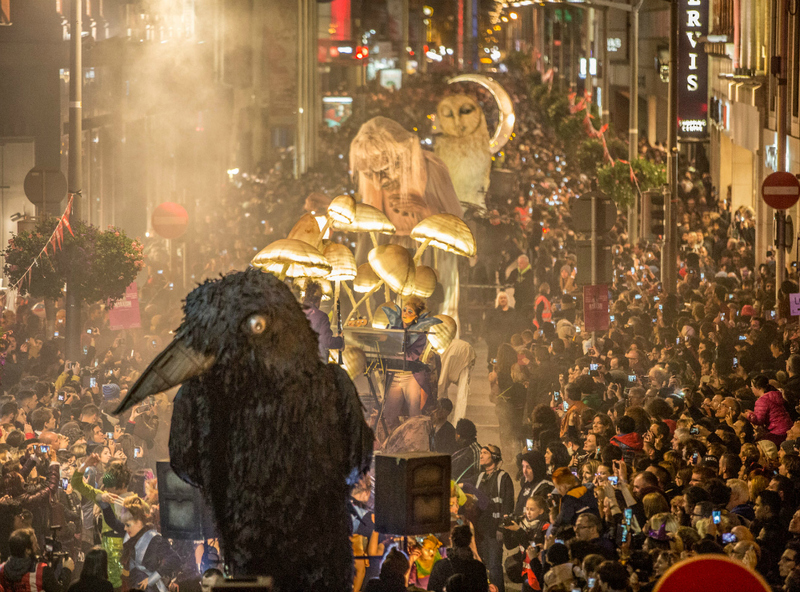 Now a much-loved Bram Stoker Festival tradition, join Dubliners and visitors of all ages along the city’s streets as dusk falls on Monday October 29th for Out of the Wild Sky, a haunting and hair-raising parade of otherworldly magic. Please follow the advice of stewards and security at all access points to the parade route, who will advise you on the where to view the parade from. 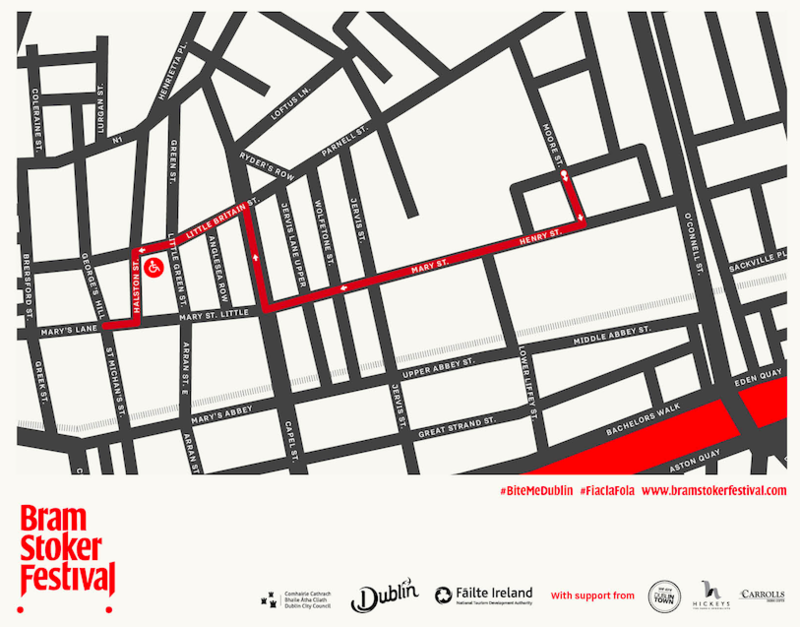 The parade will depart from Moore St. at 7pm, and travel through Dublin 1, ending at Mary’s Lane (by the Fruit Market). Route: Moore St → Henry St → Mary Street → Capel St → Little Britain St → Halston St → Mary’s Lane (end point). Arrive early – there will be big crowds and you’ll want to settle into the right spot before it starts. We suggest finding your spot along the route from 6.30pm. All streets on the route have excellent visibility, but we suggest avoiding junctions & corners, as these bottlenecks tend to be the spots with poorest visibility. The parade will take approx. 20/30 minutes to reach Capel St. There is excellent visibility along the whole route, but Henry St. and Mary St. will be very busy and crowded. There is usually more space along Little Britain St and Halston St. The parade will arrive at these streets approx 30 mins after departing Moore St.
We have a dedicated viewing area for people with accessibility requirements or special needs. We are unable to accept any further booking requests as all spaces have now been allocated and our waiting list is full. The Macnas parade is presented by Bram Stoker Festival, an initiative of Dublin City Council and Failte Ireland. With support from Dublin Town, Carrolls Irish Gifts and Hickey’s Fabrics. Devilishly fun events suitable for the whole family. Gather friends, family, fangs and vampires for these free events throughout the city. Terrifying theatre in unusual locations... join us, if you dare...!